ARMENIAN MEDIEVAL SILVER TRAM of KING HETOUM 1226-1270 A.D. Obverse: Lion walking rig.. Stunning ARMENIAN solid 14kt yellow gold cross. Fine details and quality. Hand crafted by 2nd g..
CILICIAN ARMENIAN MEDIEVAL BRONZE COIN of KING HETOUM 1226-1270 A.D. COIN: Obverse: King Enthr.. 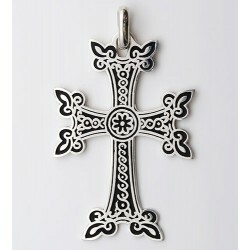 EXTRA LARGE ARMENIAN STERLING SILVER CROSS WITH BLACK ENAMEL. MADE BY 2ND GENERATION ARM..
LARGE ARMENIAN STERLING SILVER CROSS WITH BLACK ENAMEL. MADE BY 2ND GENERATION ARMENIAN ..
ARMENIAN MEDIEVAL SILVER TRAM of KING HETOUM 1226-1270 A.D. Obverse: Lion walking right, lon.. MEDIUM SIZE ARMENIAN STERLING SILVER CROSS WITH BLACK ENAMEL. MADE BY 2ND GENERATIO..
SMALL ARMENIAN STERLING SILVER CROSS WITH BLACK ENAMEL. MADE BY 2ND GENERATION ARMENIAN ..